This Saturday September 15th will see a massive field of cars journey south to Teretonga Park, Invercargill for the opening round of the three round Carters Tyres One Hour Race Series. 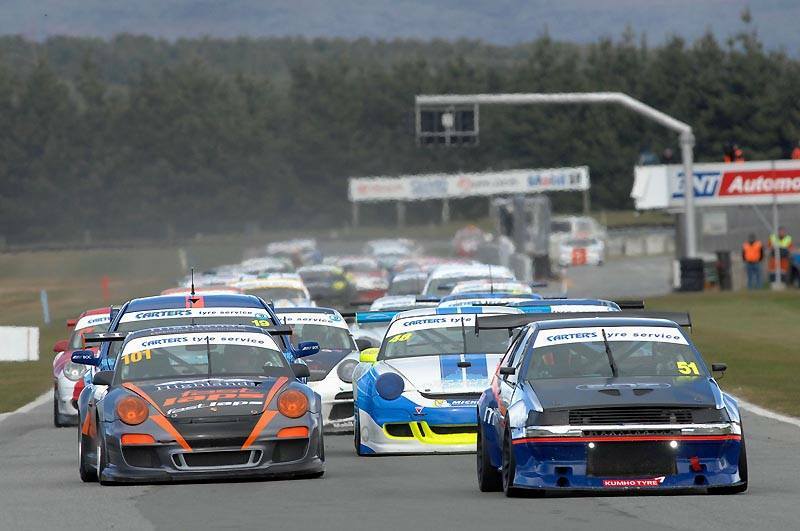 Run alongside the Carters Tyres South Island Endurance Series, the 2018 Series is again a qualifying series for the New Zealand One Hour Endurance Championship to be held at Highlands Motorsport Park in November. The One hour Series is a real mixed bag of entries with a large number of new cars for 2018. This, along with seasoned campaigners making modifications and upgrades, means that series organizers can promise that fans will again witness some outstanding racing. Entries are wildly varied and range from near new Porsche and McLaren race cars, through to little Toyotas and Hondas that are more commonly seen at the local supermarkets. So no matter if you’re a fan of V8s, turbos, rotaries, big, small, Japanese or European cars you will definitely be able to cheer on a favourite during the 2018 Carters Tyres South Island Endurance Series! The glamorous Class D (GT spec cars) is likely to be where both the race and outright series battles will be. With the series likely to be ultra-competitive, there are a large number of pre-series favourites including 2017 Class D champion Steve Parker (Porsche 997 Cup S) and other Porsche pilots including Anthony Leighs (991), Russell McKenzie (991), Danny Whiting (991), Chris Small/Johnny Small (997), Johnny Wilson (997), Rowan Shepherd (997) and Allan Dippie/Scott O’Donnell (997 Cup S) as well as upgraded cars for Jonas Paterson (991 Cup) and Martin Dippie (991 GT3RS). There are also GT4 spec cars for Grant Aitken (Cayman GT4) and David McAlpine/Kynan Yu (McLaren 570S GT4). However never discount the V8 brigade, including the New Zealand One Hour championship winning Falcon V8 Supercar driven this season by Matt Carter and young gun Jordan Baldwin and the return on the awesome MRX Holden Cruise V8 of John Wadsworth as well as, hopefully, the debut of 7 litre V8 powered Porsche 996 RSR of Angus McFarlane and Michael Bushell. The pressure is off the 2017 One Hour Series winning Toyota AE86 V8 of Dunedin’s Chris Henderson after winning the series last year, but with off season upgrades he will still be the one to beat. However in Class C (3501cc+) class where reliability is paramount he will receive some stiff competition from the Corvette C6R of Bruce Davidson and Boyd Wilson who again teams up with young gun Jordan Michaels in a V8 Ford Falcon. However watch out for the magnificent brand spanking new MR-X built Ford Mustang V8 of Paul Cooper that will be one to watch in its racing debut. Nonetheless with reliability a key factor also watch out for father and son team Garry and Ben Derrick in their older Porsche 996 GT3 who could easily take class honors through reliability if not outright speed. This class sees the classic V8 v. Turbo battle and for the turbo brigade the Nissan Godzilla is represented with double OSCA champion Murray and Karl Beeby along with endurance regular Johnny Waldron in their Nissan R32 GTRs. The competition will be as fiercely fought throughout every class in the series and Class B (2001cc-3500cc) is no different, however with the B class BMW brigade depleted for 2018 this class will see a new battle between a myriad of machinery. Three hour regulars Mike Driver and Phil Hood will use their spare Seat Leon to compete in the 1hr race alongside the similar VW Golf GTi of Craig Elstob. There are also a pair of big block Honda Civics for Geoff Clear and Ben Barlow, a pair of BMW Mini Challenges for Scott Milne and Kieran Grace and other new cars in this class include Robert Gjaja (Lotus Exige turbo) and Matt O’Donnell (BMW M1 GTr). Class A (0-2000cc) also has an incredibly strong field of entries and picking a favourite here is impossible. Contenders include current 0-2000cc New Zealand Champions Stu and Arron Black in the ex-World Touring car BMW E46 and defending SIERDC class champion Art Markus in his Beams powered KP60 Starlet. You also can’t discount the sporty little Lotus Exige of Mark Meadows along with a hoard of fast Hondas for Tim Dossett (Civic), Andrew Gibson (Civic), Andrew Kitching (Civic), Brayden Phillips/Dennis Phillips (S2000), Paul Martin (S2000) and Clark Scott/Jim Boult (Integra). Toyota is also well represented with TR86s for Tom Pickney, Alistair King, Sam Graham and Todd Foster against the lone BMW E30 of Marc Denton. After the opening round, the Carters Tyres One Hour Race Series then heads to Mike Pero Ruapuna, Christchurch on September 29th before the grand finale at Levels Raceway, Timaru on 13th October. The Carters Tyres One Hour Race Series is seen as a fun and affordable way to enter endurance racing but still experience the thrill & strategy of the old fashioned tortoise and the hare battles that endurance racing is renowned for. Although there is currently a reserve list for the one hour races entries are still being accepted for the three hour races. Thanks to series partner Carters Tyres Service as well as class supporter Allied 24/7/Fuel, the series will again have a significant prize money pool that will be paid out across all classes, as well as major spot prizes that can be won by either 1hr or 3hr competitors. Both qualifying and the race are on Saturday 15th September, with the 1hr race expected to start around 11:30am, followed by the 3hr race.